One of the things we offer here at Chicago Marine Canvas is luxury flooring. Now a days with technological advances in textiles, people aren’t putting regular pile carpet on their boats anymore. It doesn’t last as long, it easily gets moldy, it retains water, gets dirty fast, and doesn’t seem to last long. The product we use is by a company named Infinity which produces a woven vinyl flooring. 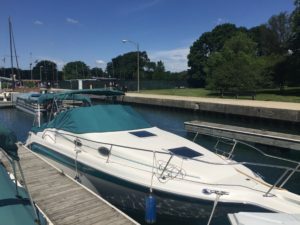 Here at Chicago Marine Canvas, we use lots of labor-saving, cost-effective tools which helps us lower the cost of our services we offer to our customers. One of those tools we use is our 3D measuring device. We use this to take all of our measurements quickly and efficiently. When it comes to flooring we head out to your boat and map out the whole flooring area that you want covered, making sure that we get the tightest fit possible, so that your new flooring looks how it should, like it was custom made for your boat. After we gather all of our measurements needed, we head back to the shop and start the design process. All of our design work is done on the computer using CAD (Computer-Aided-Design) software. This allows us to see the end product ahead of time, allowing us to make any minor adjustments we may need to before we go out to install your new product. It really helps us speed up the install process because it cuts our installs down to a one time thing instead of a multiple trip one. After we do all of our design work on the computer,mapping out your new custom flooring we send our design over to our plotter and draw out a template. 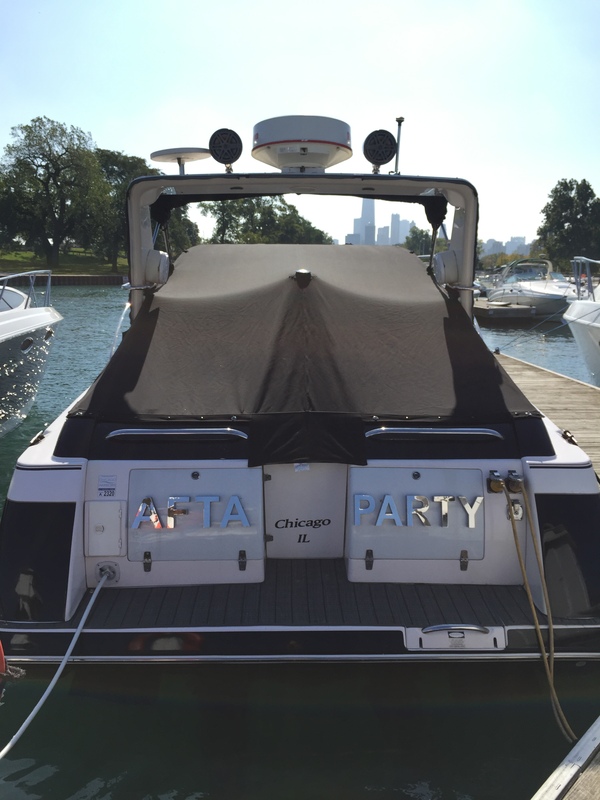 Our plotter is another one of our special tools we use here at Chicago Marine Canvas. It helps us quickly and precisely draw out whatever we need it to, that way everything is perfect! Once our templates are all drawn out, we cut them to size and lay out your new flooring. 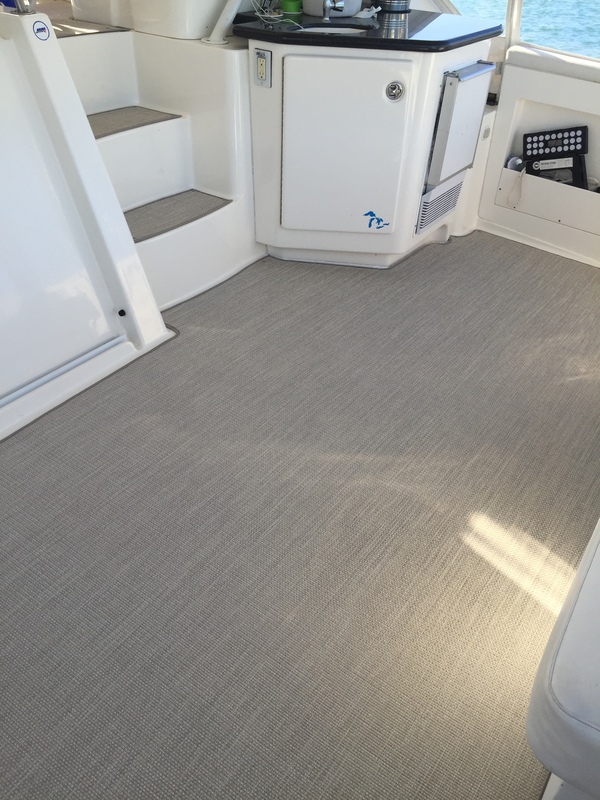 We make sure the pattern is all going the right way, so everything will look nice and neat once we install the new flooring on your boat. We trace out the pieces of the flooring, and then we cut it all out using our electric cutting knife. 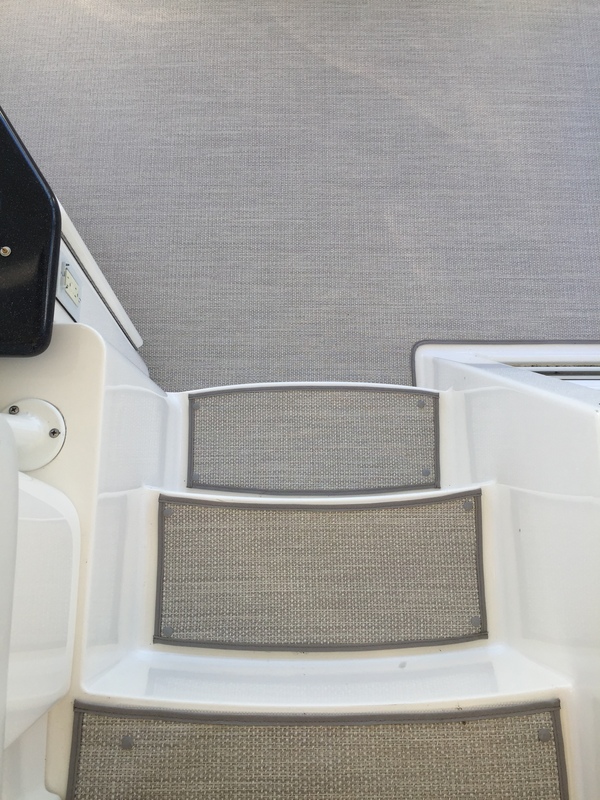 The pattern picked out for this boat is called Boucle #9.Then we bind all the edges of the flooring with Sunbrella binding in charcoal grey. 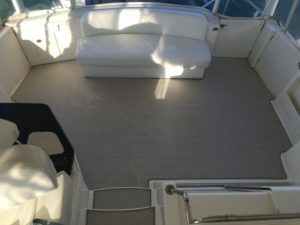 After that we roll it up and bring it back out to your boat for installation. Infinity Woven Vinyl comes with a 10 year warranty. This product is 100% recyclable and is certifiably green! It is anti-mircobial allowing no bacterial or mold growth. It is soil and stain resistant. It doesn’t get trashed by bird or spider defecation and is easy to clean! 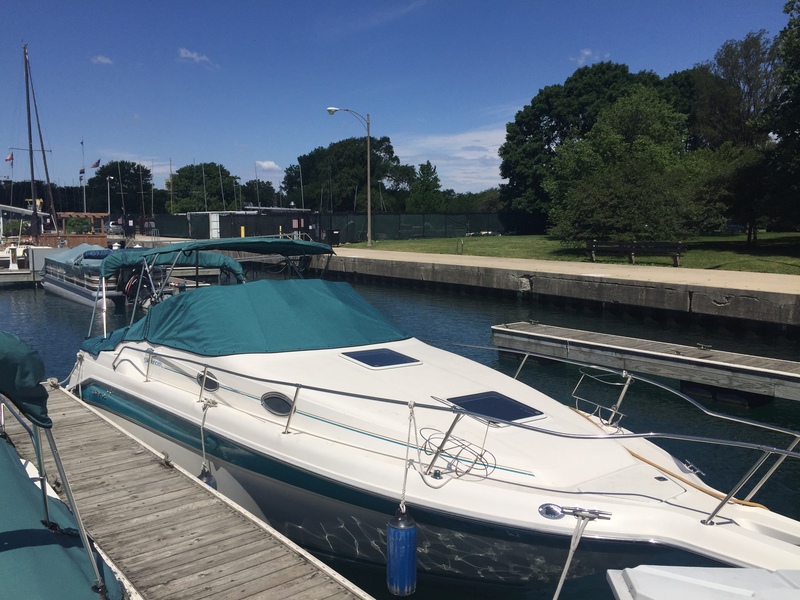 We did a full enclosure for this Sundancer 300 in the beginning of this summer. After their enclosure was finished, they were out crusin’ and lost their sunpad! 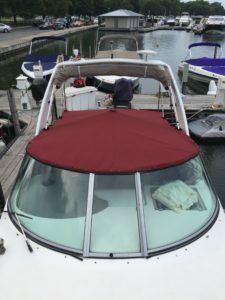 It flew off their boat, so we got to make them a new custom sunpad! Everything we create here at Chicago Marine Canvas is custom made. That means we can make you whatever your heart desires. 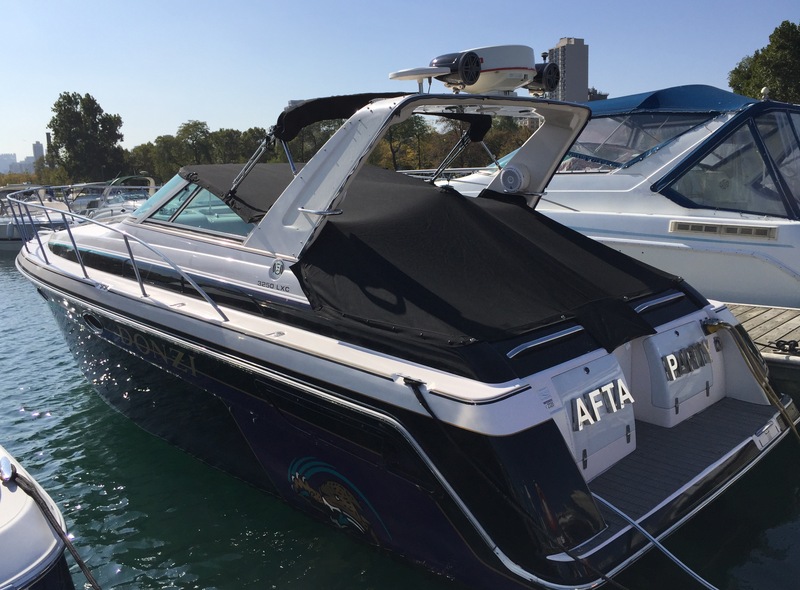 Maybe your last sunpad didn’t have enough straps to secure it to your boat, so you lost it on one ride like this customer…we can take that into consideration on your new custom sunpad! 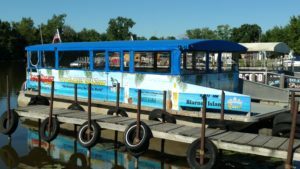 We start off all of our jobs by going on site to your boat to take measurements. Here at Chicago Marine Canvas we use lots of labor-saving, cost-effective tools. Our 3D measuring device is one of those tools! We can quickly measure your boat then head back to the shop. At the shop our designer gets to work. We do all of our design work on the computer using CAD (Computer-Aided-Design) software. After we finish up all the design work, we send everything over to our plotter, another one of our cost-effective, labor-saving tools. Our plotter can draw out the pattern for your new sunpad in minutes instead of us taking hours to do it by hand. This way everything comes out perfectly and its done quickly and efficiently! For this sunpad we used Sunbrella upholstery fabric in the color flagship silver. Sunbrella is a fade resistant canvas we use on most for most of our jobs, and it comes with a 10 year warranty. We used foam from active foam for this project, we chose Dryfast 4048. Dryfast foam is a open cell foam that is extremely porous allowing water to go through the foam, instead of retaining it like a sponge like other foams. On the underside of the cushion we did a white screen with a large u shaped chain zipper for easy removal of the foam. That way you can easily wash your new sunpad cover if it gets dirty when you are using it this year! For thread we used SunStop in white and black. 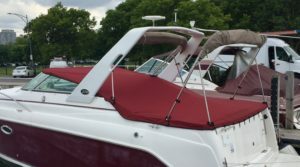 We created custom straps for this sunpad to attach to the boat. For this we used 2″ webbing that way the straps were secure and wouldn’t rip through the fabric. 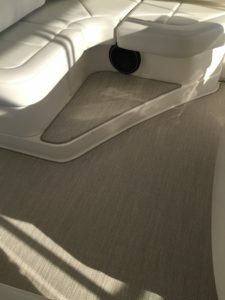 We also added a large pocket all along the back of the head rest for small things like cell phones, sun screen or anything else you want to keep secure when you are out on the water! This Cruisers Rogue 3175 was in need of a new bimini. Biminis are great for keeping you out of the sun when you are out on the water, they even keep you dry if you get caught out in a storm. All of our covers, biminis, enclosures, and upholstery work is custom made. We work this way because each boat has different framing which means each boat is different and we want your new canvas to fit like a glove! Here at Chicago Marine Canvas we use a bunch of labor-saving, cost-effective tools. The first step of our process involves us going to to your boat and taking measurements with our 3D measuring device. Using this tool speeds up our measuring process so we have more time to work on your custom design! After we gather all the measurements, we go back to the shop and upload them to the computer. We do all of our design work using CAD (Computer-Aided-Design) software, that way we can make all the proper adjustments a head of time, as well as see visually how the design is going to turn out. Once we finalize the design, we send over all the pieces of your new cover to our plotter. Our plotter draws out all of the pieces of your cover. This is another one of our labor-saving, cost-effective tools. With our plotter we can quickly draw out new designs in minutes rather then hours. This saves us time and you money in the end. After our plotter is finished, our seamstress cuts everything out, and begins the sewing process. 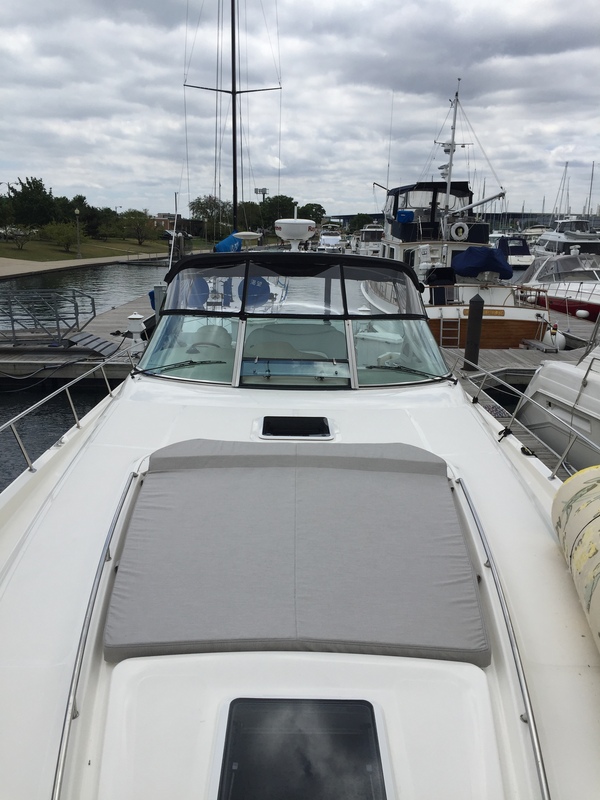 For this bimini we used Sunbrella fabric in black. 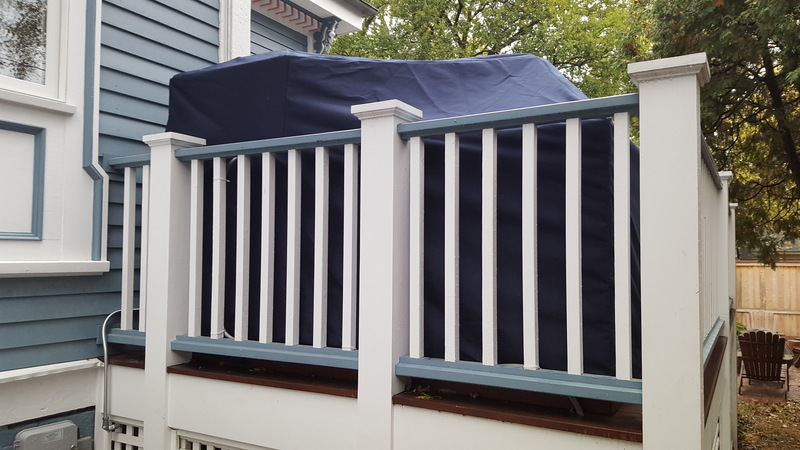 We love using Sunbrella fabric! It is fade resistant and has a 10 year warranty! To sew everything up we used GORE Tenara thread in black. GORE Tenara thread has a lifetime warranty! That means you can say good-bye to restitching and repairs! This thread doesn’t get eaten by the sun, water, or exposure to other outside elements. 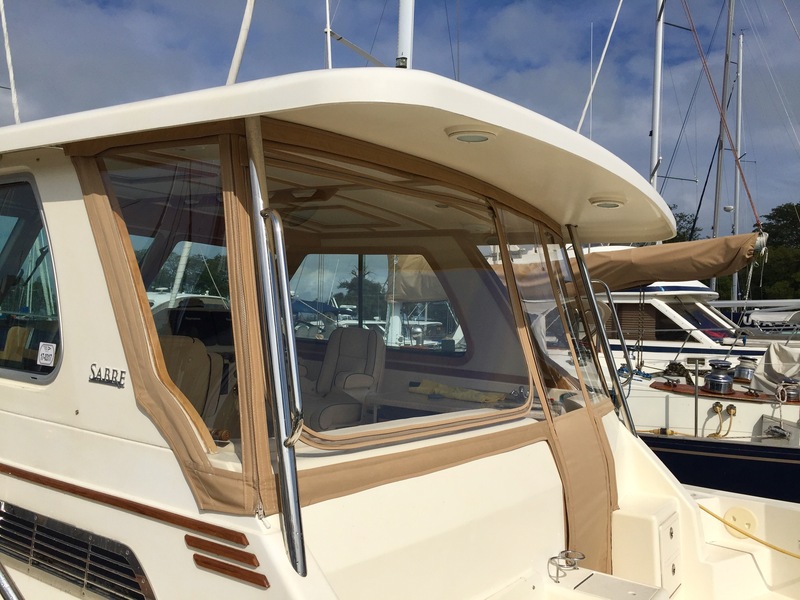 We used Lenzip zippers for this bimini. Lenzip also has a lifetime guarantee on zippers. No more zipper teeth breaking, no more zippers loosing their zip! 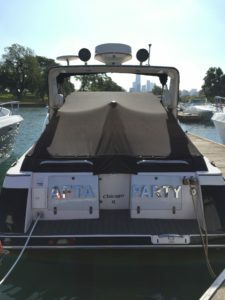 We finished off this bimini with Sunbrella black binding to make sure theres no fraying of any canvas, that way it lasts! 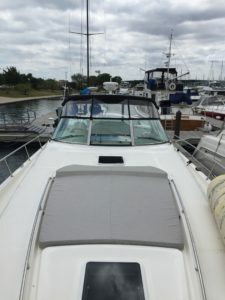 This Sundancer 270 was in need of a new cockpit cover. They contacted us because we specialize in custom covers! We start off each new job by talking with you about what you need when it comes to your new cover. Then we head out to your boat and start our design process. All of our covers are custom, so that your new canvas fits like a glove, especially hand crafted for you! 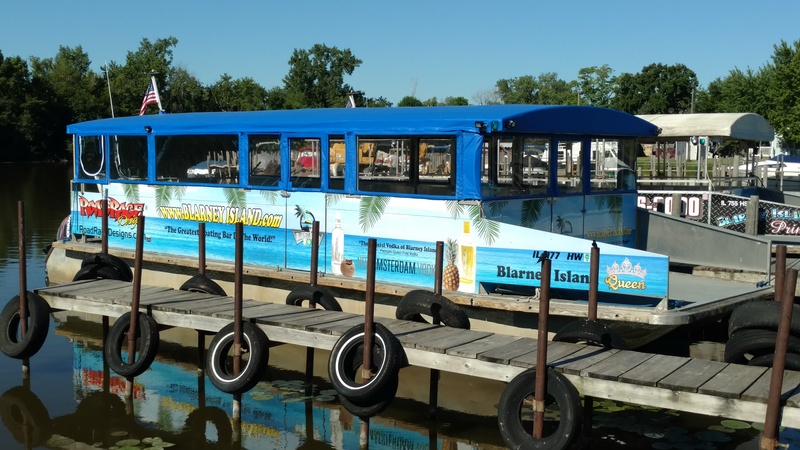 Once we travel out on your boat, we use our 3D measuring device to take precise measurements quickly and efficiently. Here at Chicago Marine Canvas we use a lot of labor-saving, cost-effective tools. After we gather all of our measurements we head back to the shop and let our designer get to work. We design all of our covers on the computer using CAD (Computer-Aided Design) software. This way we can create a 3D version of your cover, making sure everything looks perfect before we sew it up! After we finish up all the design work, we head over to our plotter and have everything drawn out. Our plotter is another one of our cost-effective, labor-saving tools. It speeds up our patterning process which saves us time and you money in the long run. After everything is all drawn out, our seamstress cuts everything out and then sews everything together. This cover was fabricated using Sunbrella fabric in Teal Tweed.We love using Sunbrella fabric! It is fade resistant and has a 10 year warranty! We backed the front of the cover wit a fabric called Evolution, that way if there was any rubbing from the windshield, it wouldn’t rip through this families new cover. We used Sunstop T135 in black thread to sew this up, along with black binding around all the edges. Then we also created boots for each of the poles for the framing around the boat. 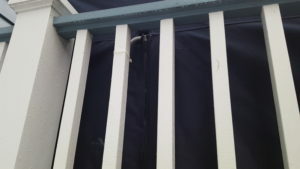 We did custom cuffs, and flaps around each pole to ensure its security and waterproofness. 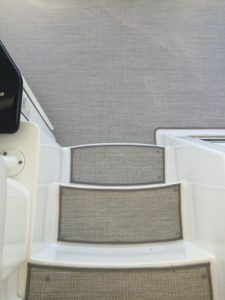 To ensure no mold or mildew, along with proper airflow when the cover is up, we installed a Boat Vent II in the back of the boat. It helps prop the boat cover up which helps prevent pooling so that water rolls off of your cover instead of sitting on it when it gets wet. We secured this cover to the boat using DOT snap fasteners in black. 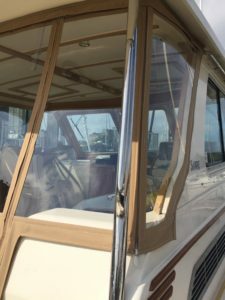 The owner of a 42′ Sabre Hardtop Express contacted us about needing their aft enclosure replaced. Their makrolon windows had been slightly discolored but more importantly, their canvas had lost its durability and waterproofness. When we do a job, we first head out to the location of the boat to take custom measurements using our 3d measuring device. This device is cost-effective and labor-saving. We can measure a boat quickly even if there are high Chicago winds. After we gather all of our measurements and think about all of your design needs, we head back to our shop to start designing your new cover. This is yet another thing that sets us apart from your typical canvas shop. We do all of our design work using CAD (computer aided design) software on the computer. This way we can see exactly what the cover will look like before its on your boat, making sure we get all the details right the first time around! thread in clear. GORE tenara thread has a lifetime guarantee, meaning it will outlast your canvas! If you get your new cover sewn up with GORE tenara thread, you can say good bye to repairs and hello to high-quality craftsmanship! For attaching the panels together we used Lenzip zippers in beige. Lenzip zippers have a life-time guarantee! This cover has all hidden kedar track that was sewn to the top of the panels, which attached to the hard top creating a water tight seal from panel to hardtop. All of the snaps are hidden as well, and are on a separate flap on the bottom inside of each panel. When it comes to custom outdoor kitchen areas, we are the right company to call. Why? Because we only create custom covers, meaning we can basically make whatever you want! 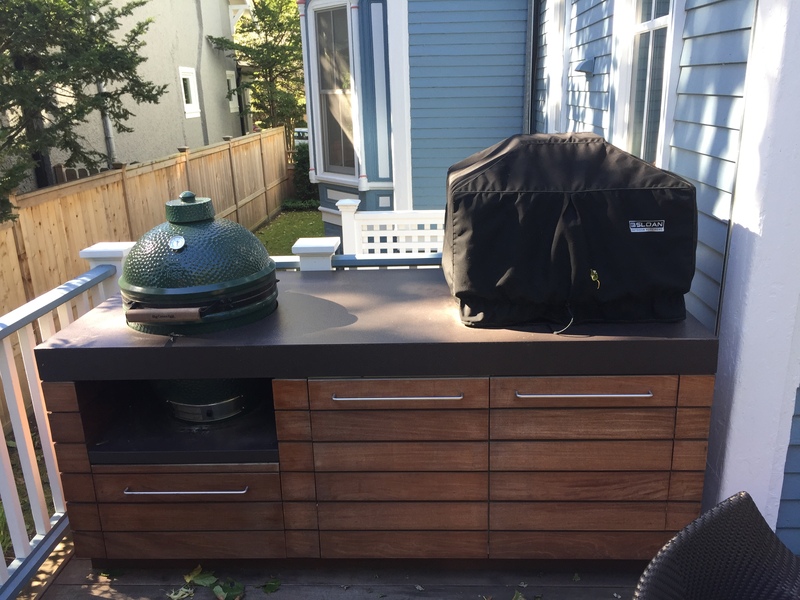 For this outdoor kitchen area we created a custom slip cover. Our process starts out by us traveling out to your home to take measurements with our 3d measuring device. 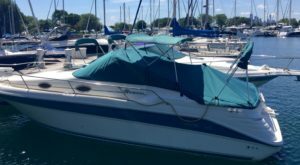 Here at Chicago Marine Canvas we use lots of labor-saving, cost-effective tools that save us time, and you money. After we gather the measurements, we head back to our shop and we start the design process. Here we make sure to accommodate to any needs while making sure to execute the right design for your outdoor area. Once our design process is all done, we draw out all the pieces of your new cover using our plotter, which is another one of our labor-saving, cost-effective tools that we use here in the shop. After that, our seamstress cuts everything out, and starts sewing it all together. 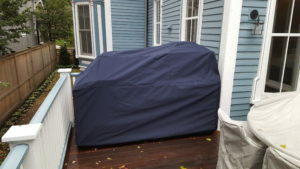 For this outdoor cover we used SeaMark fabric in Navy. SeaMark fabric is a combination of a woven acrylic facing with a textured marine grade vinyl backing on the inside. SeaMark is extremely colorfast, fade resistant, and durable because of its vinyl backing. The strength of this fabric allows it to withstand the toughest conditions, even the winds here in the windy city! It is salt, moisture, sun, wind, and temperature resistant. SeaMark fabric has a 5 year warranty. We used SolarFix thread in black to sew up this cover. SolarFix is a 100 percent PTFE (PolyTetraFlouroEthylene) fiber. It has a lifetime warranty, meaning no more restitching repairs once your cover has been out in the elements for a few years. This will save you time, and money in the end! Along the bottom edge of this cover we added 1 1/2 inch webbing for durability to ensure that the fasteners we attached to this cover, wouldn’t rip through the fabric in high winds. In the back area, and on the side we added 2 Lenzip zippers. Lenzip has a lifetime guarantee as well. We added these two zippers into the design to help ensure that the customer will get their cover on and off with ease. 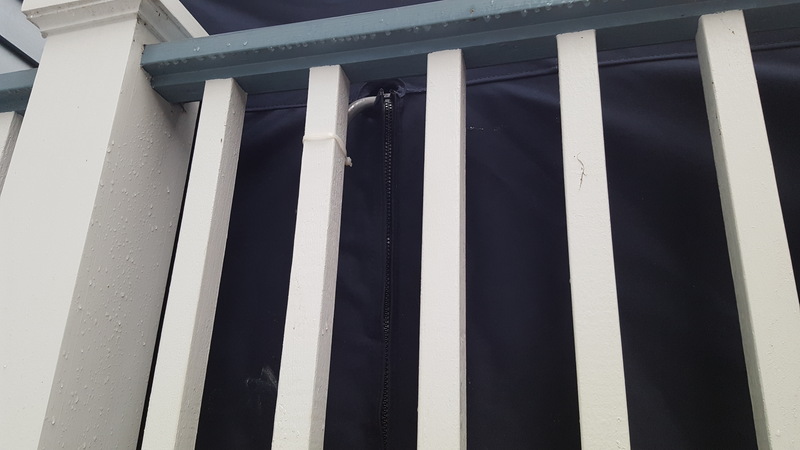 So if you have a different outdoor area, that you can’t seem to find a cover for, give us a call and well help keep your investment clean and dry all year round! This Donzi 3250 LXC was in need of a new cockpit cover so they gave us a call! 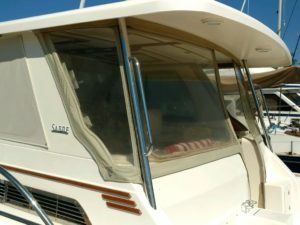 We start out all of our jobs by first going out to your boat take measurements so we can begin our process. Here at our shop we use a lot of labor-saving, cost-effective tools. When we go out to take measurements we use our 3d measuring device to digitally map out your boat. Since all boats are slightly different because of framing and other attachments, this makes it quick, and easy for us to gather our measurements as well as map out the small differences that makes your boat slightly unique then another one. After we gather all of our measurements from your boat, we head back to the shop to start our design process. When we get to this point we upload our measurements we just gathered into our CAD software program and start making the perfect custom cover for you! After our designer finishes your custom cover, we send it over to our plotter which draws it out for our seamstress, saving us time and you money! Then we cut out your new cover and our seamstress starts sewing it up. For this cockpit cover we used Sunbrella fabric in black. Sunbrella is fade resistant and has a 10 year warranty. We used GORE Tenara thread in black to sew this cover up. GORE Tenara has a lifetime guarantee, which means that this thread will outlast your canvas! No more sun-eaten threads on your new cover, which means no more restitching or repairs!!! 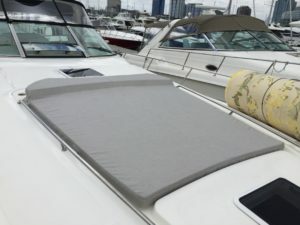 Then we used a Boat Vent II to help hold the cover up to prevent pooling, as well as bring some air flow into the boat when the cover is up, to prevent mold and mildew if the interior ever gets wet! To protect the interior of your boat, it is important to have a waterproof cover. 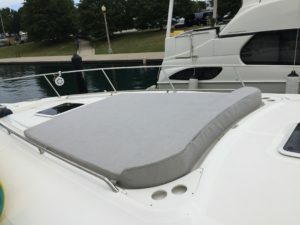 Here at Chicago Marine Canvas we do custom covers for every boat, because every boat is different and we want your cover to fit tight so there is no room for water leaks when a rain storm comes. 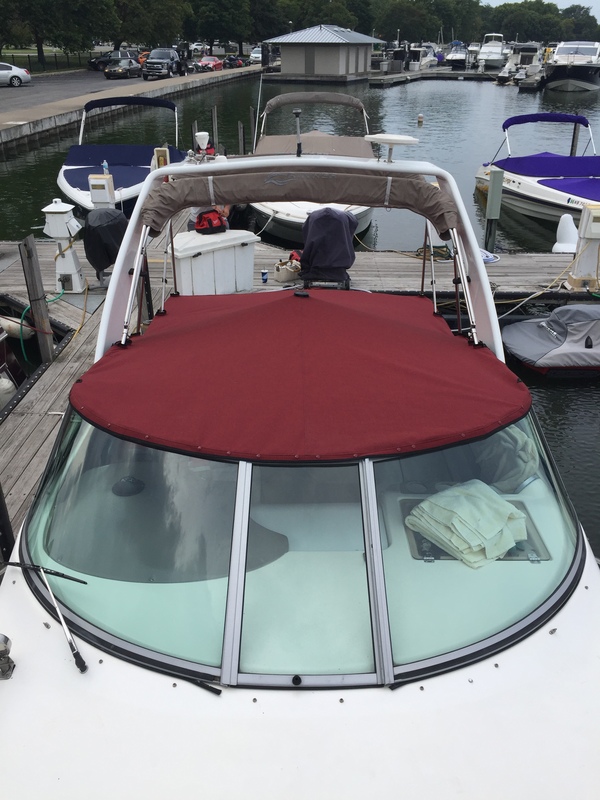 This is a Rinker Fiesta Vee 270 and we fabricated a custom cover for it this summer. We start off our process by going out on site to the boat to take measurements. 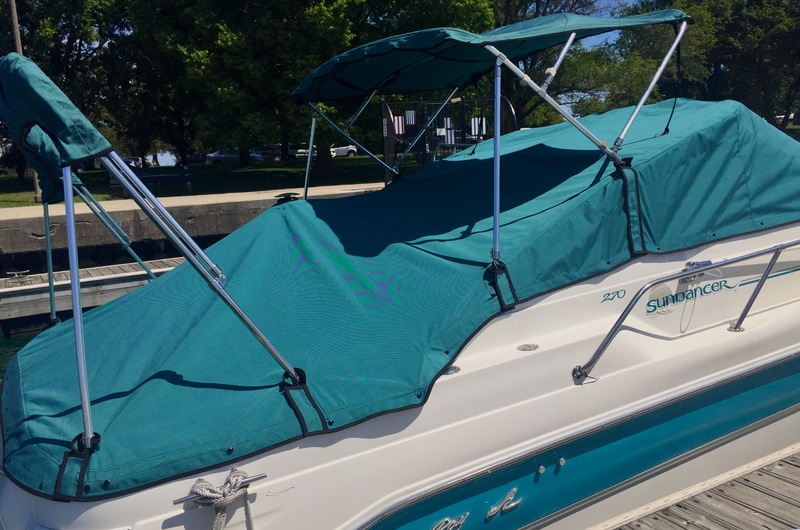 Here at Chicago Marine Canvas we have a lot of cost-effective, labor-saving tools that help cut your covers cost down while making sure it is the perfect fit! For measuring we use a portable 3d measuring device. After we gather all the measurements needed we head back to the shop to start the design process. 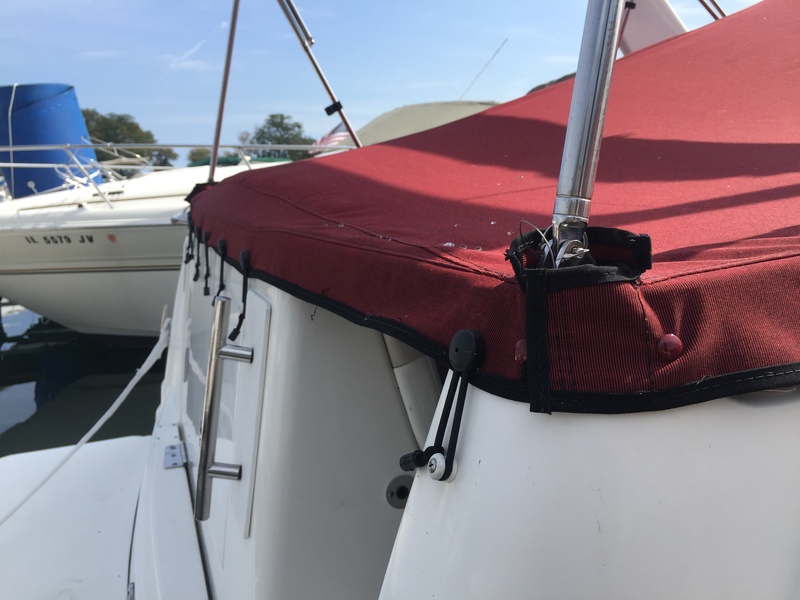 For this cover our designer made sure to make cut outs for all the framing on this boat, leaving it up to our seamstress to make individual boots for each pole, along with velcro straps to assure the cover isn’t going anywhere in these Chicago winds. After we do all of our design work we head over to our plotter which draws out all of the pieces of your cover we just finished up. This is another one of our labor-saving tools. Our plotter can quickly draw out all of our patterned pieces for your new cover, instead of us having to do it all by hand! After everything is drawn out, we hand it all over to our seamstress so she can begin her process. She starts off by cutting everything out and then looking at the pattern to figure out the best way to sew everything together. After that, she organizes all the pieces and gets to work. For this cover we used Sunbrella fabric in the color doubonette tweed. We love using Sunbrella fabric! It is fade resistant and has a 10 year warranty! To sew everything together we used GORE tenara thread in black. GORE tenara is another favorite product of ours. It is UV, salt water, chemical and extreme weather resistant! It has a lifetime guarantee, which means, all of your seams will outlast your canvas! We also installed a Boat Vent II in the middle of this cover so that all water that hits it, runs off! We used DOT snaps in burgundy to blend into this cover, as well as stay puts all along the back.